2018 Pedestrian death rates tripled! #RoadSafetyStartsWithYou #PedestrianSafety – Accurate (Peel) Appraisals Inc. This insanely morbid Gordie Howe hat-trick is nothing to be proud ! The City of Toronto must be willing to do something drastic to draw the public’s attention at large to this grisly daily reality. In the wake of this spike, the Toronto Police have responded with a new Pedestrian Safety campaign “Road Safety – it Starts with You.” This week-long campaign includes increased enforcement and education sessions throughout communities in Toronto, hosted by the Toronto Police Services. Police have also taken to Twitter to raise awareness – using hashtags such as #RoadSafetyStartsWithYou #PedestrianSafety Many residents took to Twitter stating this campaign unfairly places the blame on pedestrians and takes responsibility away from the driver. We disagree – this particular campaign is intended to protect pedestrians by promoting precautionary efforts that can be taken to protect yourself — Cross the Road as If Your Life Depends on It. Perhaps it is time for the implementation of the concept of the Arts de Mode Pin. A playful means of assisting retailers, pedestrians and drivers alike by encouraging all commuters to wear prettier brighter colours. 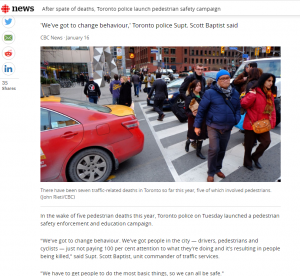 What are your thoughts and ideas on practising pedestrian safety? We would love to hear!